Cheating is rampant in our society – from athletes who take performance-enhancing drugs to financiers who cheat investors out of millions. With this emphasis on winning at any cost, it should come as no surprise that cheating is also commonplace in our schools. 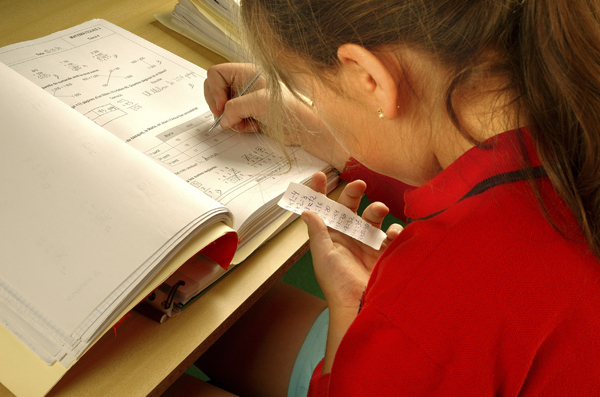 One of the main reasons kids cheat is excess pressure to get good grades. For some, there may be an element of danger that’s exciting, or they may be afraid of failing their parents, especially if they’re overwhelmed by too many extra-curricular activities. “Kids can also rationalize cheating in a number of ways,” Dr. Putt said. Maybe they think everyone else is doing it, so they should too. Or cheating is justified because the teacher is too hard, mean or unfair, or they just need to get through a class without lowering their GPA. Shift the focus away from your child’s grades to the quality of her schoolwork and the development of critical thinking skills. Avoid rewards or punishment for specific grades. Instead, recognize effort and hard work. Discuss what qualifies as cheating, especially those gray areas. If your child is unsure whether it’s cheating, a good test is whether he would do it in front of you or the teacher. If your child is stressed over schoolwork, identify the source and take steps to reduce it. Consider the messages you send regarding honesty and integrity. Do you return to the store when the cashier forgets to ring up an item? Do you let your 14 year old pass for 12 to get a lower admission fee? Use real world examples of cheating or scenarios in movies or TV to start conversations about cheating and share your values. Talk to your child about how to respond to pressure to help a classmate cheat. Help him understand how it’s more harmful in the long run.